If only one GPS antenna can be installed (due to structural or other reasons), it is however possible to operate two GPS receivers with one common GPS antenna by using the passive GPS antenna splitter 4443. 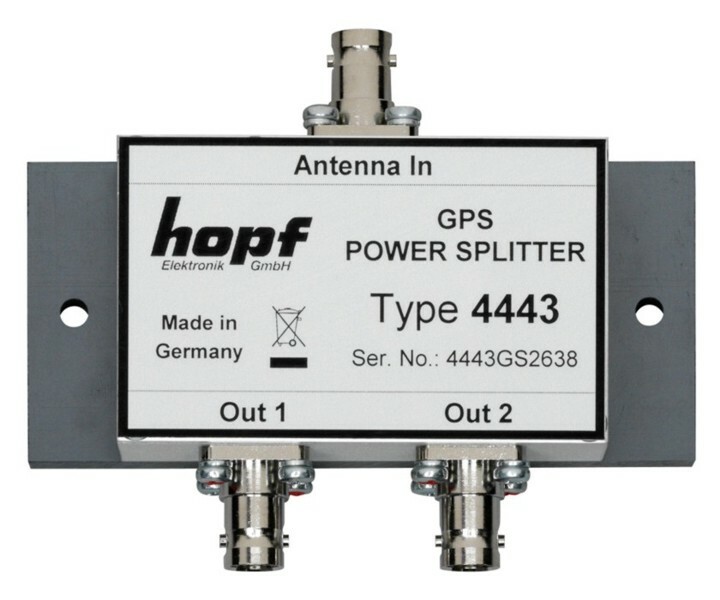 Voltage for Power Splitter 4443 is supplied internally by the system via the GPS antenna cable of the connected hopf GPS receivers. No external power supply is needed to operate the application. The GPS antenna splitter 4443 can also be used together with a third-party device if at least one of the connected GPS receivers provides suitable supply voltage via the antenna cable and if all connected components are working in accordance with the original GPS L1 antenna signal. The power splitter is built in a HF-proof housing with an insulated base plate. The unit can therefore be easily screwed to the wall near the GPS receivers. The GPS antenna is connected to the BNC-connector called 'Antenna In'. On the opposite side of the housing two signal outputs to the GPS receivers are located.